In this game of European Blackjack, you can count on the dealer to always stand on 17, soft or otherwise. You can split, but re-splitting is not allowed. Split aces can take one further card, and then you must stand. If split aces receive a 10 card, you get 21, not blackjack. You can double down at 9, 10, or 11 at a wager equal to your original bet, but never after a split or when you are dealt blackjack. You cannot surrender. When it comes time to make your first bet, you get to choose between any one of 8 different chip sizes, and use various combinations to bet exactly how much you want, anywhere from 1 to 500 USD/GBP/Euro. Winning against the dealer with a standard hand pays back at 1:1, while getting blackjack pays 3:2. If you choose to take insurance (basically as side bet, wagering that the dealer gets blackjack when he shows an ace), then you can get paid 2:1 if you guess right. European Blackjack is a game that is easy on the eyes as it is to play. Microgaming went with a simple rule when designing this game – smooth and sophisticated. Everything looks clean and sharp, it’s easy to see what’s going on at all times, and the gameplay is extremely simple and intuitive. All the main buttons are on the bottom of the screen, and the ones on top are the seldom-used functions like settings and such. The cards look great on the plush, green table, and area always easy to read so you know exactly what’s going on at all times. 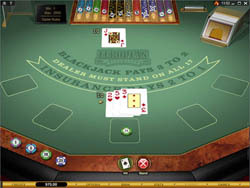 European Blackjack Gold differs from the original version in the following ways: all the main buttons show up only when you need them to reduce clutter, and the golden ones along the bottom are seldom-used functions like settings and the game menu. Be careful when it comes to making an insurance bet. The house always has the edge on these, unless you have been carefully counting cards and know that the dealer has a very good chance of getting Blackjack. It’s basically a sucker’s bet – anyway, why would you want to bet on yourself to lose? European Blackjack is a great game for lovers of straight up, old school, real casino style blackjack. It looks real, it plays real, and it pays real too! This is one of Microgaming’s finest, so if you’re in the market for an excellent all-around blackjack game, try this one on for size.